Participants at the Gingins CC U11 & U13 Indoor Tournament last November will recall being regaled by a number of Gingins U15 lads. Instead of being asked to buy raffle tickets in support of the Club as we’d done at the two previous tournaments, our visitors were instead asked to contribute to the Chance to Dream Foundation. “The Chance to what?” people asked. 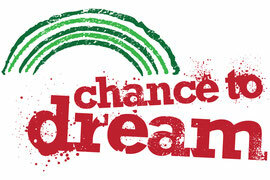 The Chance to Dream Foundation is a new kids’ charity. It has a unique approach. Adults run most kids’ charities. Chance to Dream is different – it’s a charity for kids, run by kids. The idea for the Foundation started here in Gingins. My son has a poster of Mike Hussey on his wall and one morning a few years back, he looked at it with dreamy eyes when I went into his room. He told me “every morning I wake up and look at that poster and dream that one day I could be like him”. Apart from being pleased that he had chosen Mike Hussey as his role model, I thought how great it was that the boy had that chance to dream, to dream of being like his hero. I wondered how many kids there must be around the world who dream similar dreams – can you imagine the millions of young Indian lads who dream of being Sachin Tendulkar? Similarly, though, how about all the kids who don’t get that chance to dream? Who live and struggle each day in poverty. It struck me that every kid deserves a chance to dream. It also struck me that lads like mine here in wealthy Switzerland who have all their bats and other equipment, who have teams to challenge and venues to play at; they’re lucky kids and as they grow older, we have to be certain that they learn not to take this opportunity for granted. We have to ensure they know how to give as well as to receive. And with that, the idea for the Chance to Dream Foundation was born – that kids in the developed world could raise funds and bring support to kids in the developing world, giving them the chance to dream, the chance to be thrilled to their eyeballs at receiving the gift of sport. Gingins CC set up the first Chance to Dream Team in mid-2012. We invited any of our U13 and U15 players who were keen to have a go (at that stage we didn’t have any U17 players). Six of our lads signed up and we also sought the guidance of two parents – we want the kids to run their activities but feel a light touch from two guiding parental “mentors” is important. The six Dream Team members met a few times with their mentors and planned some activities and events. The key thing about Chance to Dream is that the kids have to make the plans, do the organizing, everything; the mentors are there to guide only, to answer any questions. The Dream Team members learn new skills – organizing, fundraising, communicating, presenting, planning, managing money etc so in many ways, they are still “receiving” only now they’re receiving a whole new batch of useful skills with a great purpose attached. One lad is engaged on a five-year project to walk across the Pyrenees from the Atlantic to the Med, 100km per year and had already raised close on £1,000 through sponsorship. The other lads decided they would run a game at the U11 & U13 tournaments. They planned to make a presentation at the tournament dinner and to conduct a silent auction for some hotel stays. What unfolded was so thrilling for the lads because it was so unexpected. The game went well as did the silent auction but then the dinner’s participants, in response to the lads’ presentation about the Chance to Dream Foundation, sent the hat around and raised a great amount of money. Altogether, the lads raised CHF2,545 over the tournament weekend – many thanks indeed to everyone who gave so generously!! The Gingins CC Chance to Dream Team is busy raising more funds. As Chance to Dream is a new organization, we have to have £5,000 in our bank account before we can register as a UK Charity. The lads have already raised close on £3,000. Once we hit that £5,000 mark, we will submit our documents and will be officially registered as a Charity soon after. But most importantly – the lads want to embark on the most rewarding phase of their work – distributing the money they’ve raised. They have made a plan to buy cricket equipment for disadvantaged kids in India. Through our link with Manoj Parmer of MP Sports in the UK who’s Sports Development Trust runs coaching clinics and distributes equipment in rural India, the boys are now making plans as to how and what to give. There is talk of a trip to India later this year to disburse bats and other equipment themselves. More lads are joining the Gingins Chance to Dream Team, it really is open to anyone who wants to participate and more activities are planned. It’s time now to see if others want to establish their own Chance to Dream Teams. And of course, we need not restrict it to cricket. At Chance to Dream, we feel we have a powerful, exciting and unique model to get millions of kids connected across the globe; kids helping kids, through sport. And please do keep checking in on our website link. We anticipate it will be another month before we’ve launched it. In the meantime, dream up your own ideas of how you too can give kids that chance to dream.